at the 3-day workshop in August! 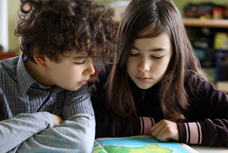 Critical Exploration is a distinctive teaching approach that powerfully supports both original inquiry and democratic conversation — all while engaging students in developing deep understandings of the subjects they study. Through CE, teachers bring students into direct contact with complex, thought-provoking materials, using time-tested techniques that encourage students to express their thoughts, continue thinking, and discover and pursue promising puzzles and questions. This transformative process expands students’ awareness of their own intellectual capacities while heightening teachers’ appreciation of their students’ potential. This workshop, held in Cambridge, Massachusetts, is designed to help participants stretch their understandings of critical exploration, whether you’ve practiced this approach or are encountering it for the first time. Together, we’ll examine concrete teaching strategies that will challenge your students, bolster their confidence, and enlarge their capacities to share and build on each other’s ideas. Through the Critical Explorers Summer Workshop, you’ll engage in, reflect on, and create activities, questions, and curriculum that inspire thoughtful and collaborative learning environments, and you’ll strengthen your teaching, whatever your previous experience. The Critical Explorers Summer Workshop will take place August 6th-8th (Tuesday to Thursday), 8:30 a.m. to 4 p.m., in Cambridge, Massachusetts.